Rent apartment in Bucharest Romania with EastComfort. Our agency manages over 50 quality apartments in Bucharest. Select an apartment in Bucharest by price, the number of guests or by our recommendations. This self-catering studio apartment, available for rent in Bucharest at affordable price is equipped with modern conveniences, making the apartment a particularly good choice for bussinesmen or couples. Internally furnished to high standards, with a comfortable living area (45 sm), blue-yellow warm decorations, hardwood floors and air conditioning, it provides accommodation for 2 persons (one double bed in the room). Besides the sleeping place, the day corner consists of a coffe table and 2 armchairs. The kitchen is equipped to cook and have dinner. 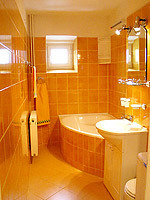 The nice bathroom is fitted with bathtube and shower fixture, lavatory, toillet and washing machine. The Bucharest Mall Complex hostes some 70 stores (including a large supermarket), over 25 restaurants and cafes (most of them gathered together in a food court with common seating), the 10-screen Hollywood Multiplex Bucharest Mall cinema, a bowling alley, a child-care center, a video games arcade, a public library, and an exhibition space for young artists, surrounded by an airy atrium, with escalators running at skewed angles. A fountain located on the ground floor directly under the dome periodically shoots jets of water up to the roof. The parking lot has over 1000 spaces, in a city where having any parking spaces for a commercial building is a novelty.